Let's talk about the pavilion's building for starters. The mansion is intended to be the "people's mansion" and was constructed with 110,000 bricks handmade from Georgia red clay. 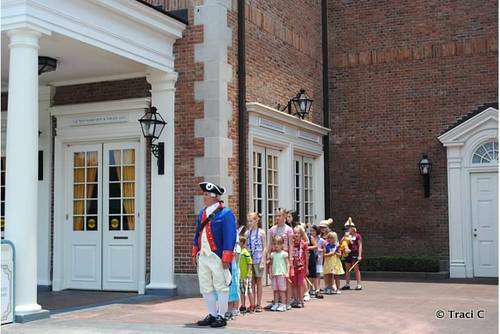 The building's design is a mix of 1700s Georgian style, Colonial Williamsburg, Independence Hall, Monticello, and the Old State House in Boston. The entire pavilion is 108,555 square feet and the rotunda is 35 feet high. 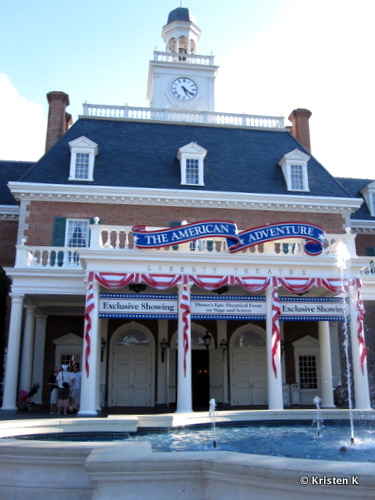 Housed inside the mansion is The American Adventure show which is a 30-minute show that takes guests through the history of the United States. The show is narrated by Ben Franklin and Mark Twain who are joined by 35 other audio-animatronic figures. The show includes film footage of historic events and patriotic music. It really is a must-see show for anyone visiting the pavilion. Scenes in the show include the Pilgrims, the Boston Tea Party, writing the Declaration of Independence, the Revolutionary War, slavery and the Civil War, both World Wars, and events from recent history. While you're waiting to enter the theater for The American Adventure show, you'll likely be treated to the super talented Voices of Liberty performance group. 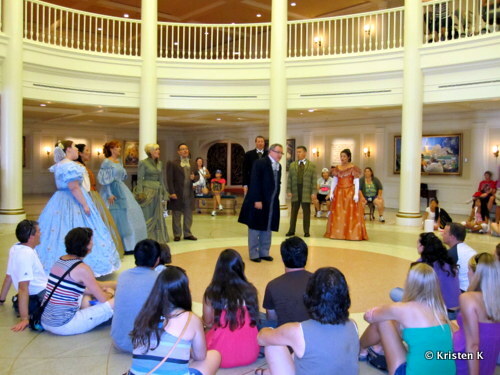 This a cappella group sings American patriotic songs, and usually perform about 15 minutes prior to the showing of The American Adventure. You don't want to miss them. Another group that performs regularly at the pavilion is The Spirit of America Fife and Drum Corps. On a recent trip my kids had a chance to be part of a special performance with the corps when they were invited to join the performers as "sons and daughters of Liberty." Having never seen this happen before, I urged the kids to join in. The Fife and Drum Corp lined up all the kids who were chosen to participate (about 10 kids in total) and they marched them around the pavilion while performing some patriotic songs. At one point they lined the kids up and declared them "official sons and daughters of Liberty" and gave each child a copy of the Declaration of Independence. While The Spirit of America Fife and Drum Corps perform every day at The American Adventure, I am unsure how often the "sons and daughters of Liberty" performance happens. But if you're lucky enough to be around when it does, I hope your kids can participate! 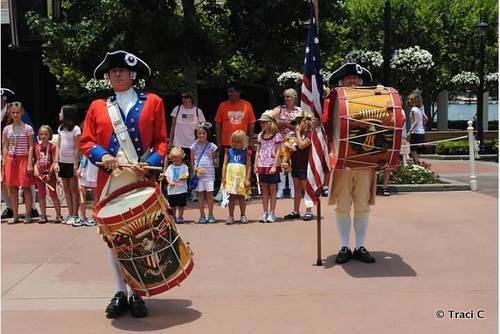 UPDATE 8/29/2014: As of September 27th, 2014 the Fife & Drum Corp will no longer be performing at Epcot. You can find more information HERE. 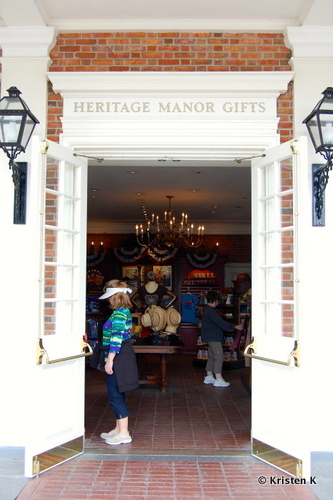 The American Adventure Pavilion is also home to the Liberty Inn, a quick service restaurant serving "all American" food (great for the picky eaters in your group) and a small gift shop, Heritage Manor Gifts where guests can find American-themed gifts, and the American Heritage Gallery of art. Across the walkway from the mansion is The American Gardens Theater where the Eat to the Beat Concerts, the Flower Power Concerts, and the Candlelight Processional take place throughout the year. Thanks so much to Traci C. for this fantastic guest post and use of her images. 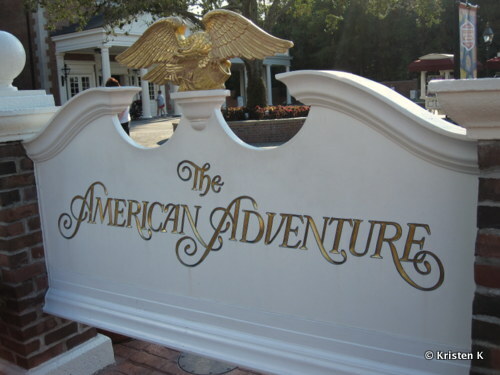 Do you stop at The American Adventure when you're at Epcot? Leave us a comment and let us know what you think of the pavilion and show! Seeing all the flags before the show is probably my favorite part. Walk past it? I love the American Adventure! Interesting, entertaining, educational. And a great place to cool off. Never miss it. The song at the end of the show always makes me cry. Seriously, do some people really just walk by? We stop here every trip. But we are history buffs. We never miss the Hall of Presidents either. I always stop too see Voices of Liberty and The American Adventure show. Yea - I actually know a lot of people who skip this one. They figure that they're already in America so why stop at the pavilion. Though I love the show here, I don't always stop to see and I've been known to walk past.